Since EasyPackMaker is a web application, there are no requirements for the operating system. Graphics resolution of at least 1024 to 768 pixel. For comfortable work, 1280x1024 pixels or more is recommended. You must register for full access. For registration you need a active e-mail account. Anonymous mail services and browsers using onion routing technology (Tor and others) are not allowed. Attention! If you can't pass the Google reCAPTCHA test, you can switch to text CAPTCHA by clicking the "Change Captcha type" link. 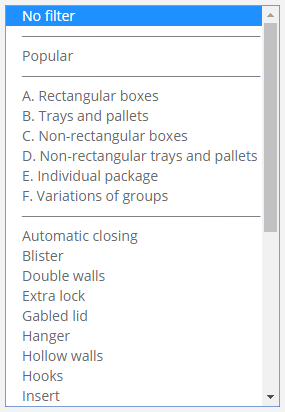 Additional fields can be left blank. The username must contain only Latin letters and numbers. The minimum length is 2 characters. If the username is already in use, you will see a warning. The password can contain lowercase and uppercase Latin letters, numbers, special characters. The minimum length is 6 characters. 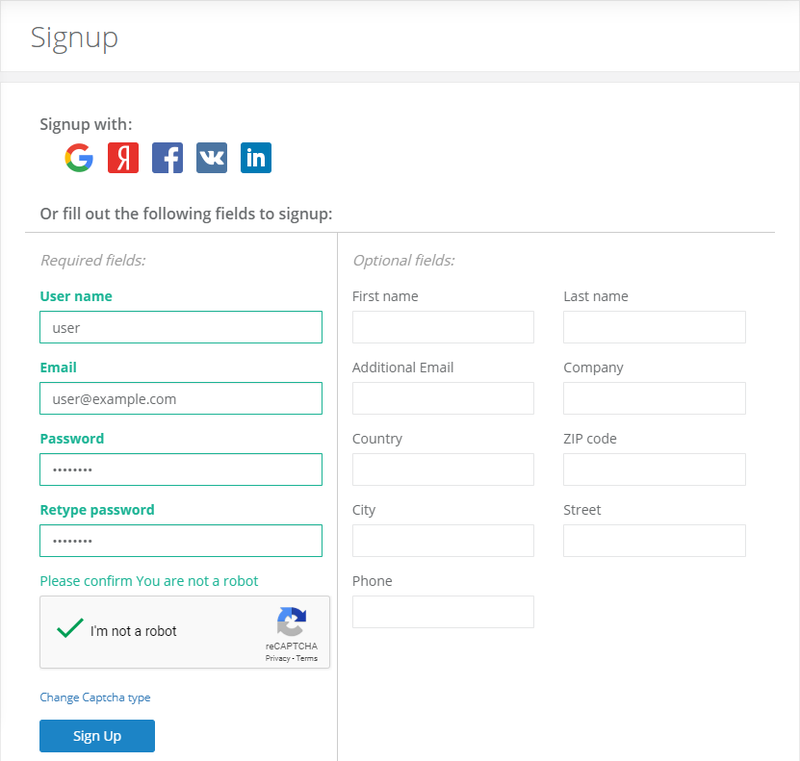 After you press the "Register" button, you will receive an email containing a link to activate your account. Follow the link and your account will be activated. Attention! In some cases, the letter with the link is filtered by the mail service and falls into the "Spam" folder. If you do not receive a message for a long time, check this folder. If you did not receive the email with the activation code you can resend it. Log on to the site using your username (or email) and password. If you forgot your password you can reset it. To get started, go to the generator page. The link is located in the top menu. The generator interface is divided into two parts: model selection and parameters input. Choose the packaging model you need. All models are sorted alphabetically and numerically. The encoding of ECMA and FEFCO is described in detail in the relevant sections of the site. To facilitate the search, you can apply a filter for ECMA or FEFCO catalogues. Filter is divided into 4 sections. "No filter" – all available templates are displayed. "Popular" – the most frequently downloaded models are displayed, sorting is performed from a larger rating to a smaller one. Then follow groups of models. Group descriptions are presented in the site section. The last part of the filter is the choice of models by their characteristics. When you click the thumbnail, the right side displays the 3D image of the package and its drawing. After selecting a model, click on the "Next" button and go to the parameters input page. The input fields are located on the left side of the page. Their designation is shown in the drawing in the center of the page. The sample and the 3D image are examples of packaging and their shape and dimensions are independent of the input parameters. You can evaluate the packaging design by clicking the Preview button. The set of fields depends on the type of model chosen. When entering values, they are checked. In case of errors you will receive a notification. The "Paper Thickness" parameter for ECMA catalogue is entered in thousandths of the selected of measure unit (for example, if the unit is a millimeter, for values of "0.4" mm, enter "400"). 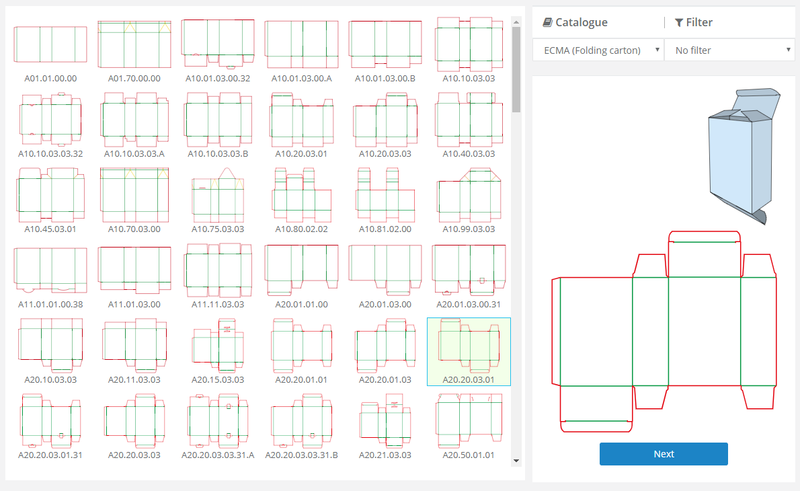 For some types of packaging, some dimensions depend on others and are therefore automatically calculated and unavailable for input. The model is always calculated in PDF format. The "Load To Browser" checkbox (enabled by default) affects how the calculated model is loaded. There is either direct download, or the model is loaded into the browser window for preview. In this case, it can also be saved. Models are generated in PDF format. You can open it with any vector editor or import it into a CAD application. The calculated models are stored on the User's Page and saved for three months from the download time. On the right side of the page is the package parameters area. The set of parameters depends on the type of package. All of them have descriptions, some are supplemented by pictograms. Also here you can switch the units of measure (points, millimeters, centimeters and inches). Using the "Input Validation" switch, you can disable automatic validation of input values. Be careful! Model can be calculated with errors! You must understand exactly what values you enter. In some cases, the value of the parameter is switched to a single value and does not depend on the user's actions. For example, for a model with "A20" flaps, with a W (width) value of less than 20 mm, the dust flap will be without a cutout, since with such small dimensions this complicates the installation of the knifes and reduces the strength of their fastening. The parameter "Knife info" is useful in calculating the load on a punch press. Usually the maximum length of the knifes is indicated in the technical characteristics of the punching press. At the bottom of the page is a description of the packaging design and if you chose the tariff plan 1, the cost of model. Due to the high complexity of calculations, the system can not prevent all errors. Also rough errors like obviously too short dimensions will not be alerted in all cases. Be especially careful if input validation is disabled! Pay attention! The user is responsible for the accuracy of determining the size of the package and checking the results of the calculation. Before making die-cutting stamp, always check the correctness of the design and the option for assembling the package taking into account the selected material. 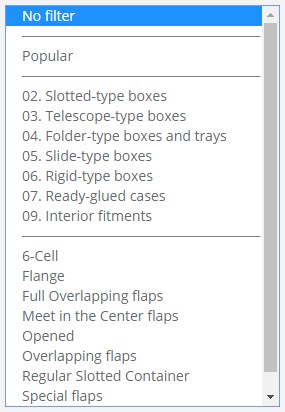 The finished drawing of the box must be cut out on the selected material (preferably on the cutting-folding plotter), and make sure that the product is correctly assembled and has the necessary dimensions. 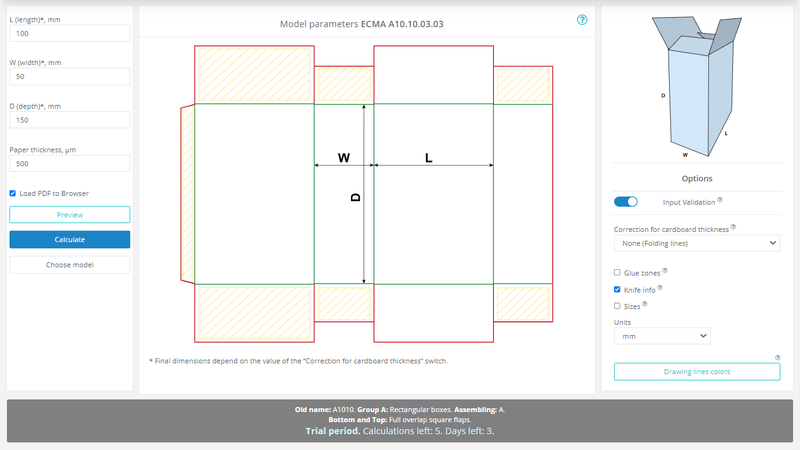 After registration, the user get a "Trial" status and a five-day trial period to familiarize with the service and calculate 10 models. After trial period is ended, or reaching the limit by the number of models, user goes to standby mode before switching to one of tariff plan. You can add funds or subscribe on the balance page. When any plan is activated, user get the "User" status. In this case, trial period will be finished. This plan operates with zero or negative balance. The calculated model is placed in the basket. After payment it can be downloaded from the user's page. Plan 1. Payment for each calculated model. Payment is made from the user's account. If the balance is negative, the model is not generated. The cost of the model is determined by its complexity. There are 5 categories of complexity. When choosing this tariff plan, the cost is indicated on the parameters input page, in the model description frame. When you re-calculate the model with the same parameters, no fee is charged. Plan 2. Monthly subscription with a limited number of downloads. The number of months can be from 1 to 12. The limit is 20 downloads per month. For each month, starting with the second, there is a progressive 1.5% discount. Plan 3. Monthly subscription with unlimited calculated models. The number of months can be from 1 to 12. For each month, starting with the second, there is a progressive 1.5% discount. When the subscription period is over (or reaching the download limit), the tariff plan will be changed to "Plan 1". During the validity of any subscription, you can subscribe to the next period, which will be automatically activated when you reach the limits.